On September 27, South Sudan and Sudan signed a partial peace deal in Addis Ababa, Ethiopia, marking the conclusion of the final round of negotiations between the two nations. The agreement, which came five days past the September 22 deadline, includes arrangements for key economic and security issues but fails to resolve disputes on Abyei and their common border, leaving sharp points of disagreement between the two countries. Oil — The oil agreement will enable the restart of oil flow from South Sudan to Sudan, which is significant considering the economic constraints both countries face. 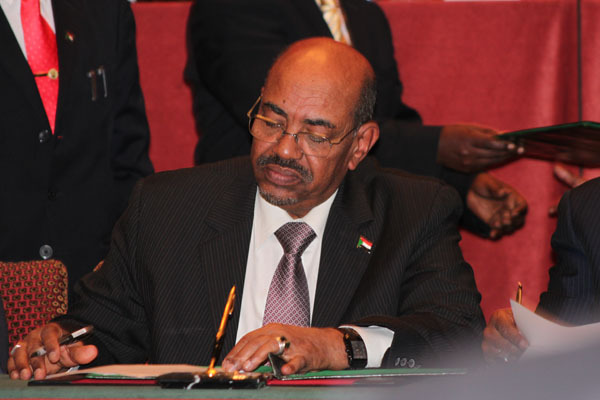 The deal includes a $3.028 billion financial assistance package from Juba to Khartoum. Disputed and claimed border areas – The two parties agreed on a mechanism for resolving the five disputed territories along the North-South border. The new mechanism will defer disputes to a panel of border experts who will then issue an informal, written opinion on the disputes. If disagreement remains on both sides, the disputes can be taken to arbitration. Security arrangements – The final agreement established a Safe, Demilitarized, Border Zone, or SBDZ, along the border to create a buffer between the two countries. The deal establishes that the border should be demilitarized 10 km on each side of the A.U. centerline with one exception:,It states that the two militaries “are to remain in their current base locations” beyond the northern and southern boundaries of the contested 14-mile area between Sudan’s Darfur region and South Sudan’s Northern Bahr el Ghazal state. Hsiao states that while the agreements mark significant strides and will do much to defuse long-standing tensions between Juba and Khartoum, they do not offer long-term security solutions. “Unresolved issues of Abyei, border disputes, and the ongoing conflicts in South Kordofan and Blue Nile remain the greatest threats to peace and security between the two countries,” she writes. Hsiao also notes that the partial quality of the agreements raises several issues about the nature of the negotiations. “The parties were only able to reach agreement, by and large, on issues on which Khartoum was willing to negotiate,” Hsiao writes, adding that a sentiment of ‘Better a partial deal than no deal at all’ was prevalent as the final round of negotiations drew to an end. Moving forward, the international community should work to support implementation of the signed agreements, as well as resolutions on the status of Abyei and the humanitarian situation in Blue Nile and South Kordofan states. A focus on a comprehensive outcome will be crucial in establishing long-term peace in the region.